The Iran-Syria Alliance: Sectarianism or Realpolitik? These two contradictory remarks were made in the wake of the Arab “revolutions,” not by two rival Middle Eastern leaders, but by two longtime allies in the region. The first statement is from Iran’s leader Ayatollah Ali Khamenei, who has described the Arab uprisings as an “Islamic Awakening.” The second came from Syrian President Bashar al-Assad, who has called political Islam a “plague” and asserts that Syria is “the last stronghold of secularism” in the region. The conflicting statements run against the grain of the dominant narrative that describes Damascus-Tehran partnership as sectarian and its raison d’état the creation of a “Shi‘a crescent.” In the past four years, the mainstream media and pundits have had a tendency to overplay the split between the Sunni and Shi‘a to explain the sanguinary war in Syria. In doing so, they have reduced the manifold crisis and the complexity of the Damascus-Tehran relationship to a simplified narrative of Sunni-Shi‘i sectarianism. As a key feature of the modern Middle East, the Syrian-Iranian axis has been an important factor in shaping the geopolitics of the region in the past three decades. The partnership between a pan-Arab secular state and a Persian Islamic Republic—and the longevity of this alliance—has always triggered the curiosity of observers, to which a plethora of academic and journalistic writing attests. Some observers, especially critics of the alliance, tend to trace the roots of the relationship to the reign of the Shi‘i clergy in Iran and the Alawite in Syria and simply conclude that religious affinity has been inherent in the formation and continuation of the partnership. This sectarian narrative, so prevalent in the mainstream media, downplays significant political disagreements between Damascus and Tehran and overlooks the irony of the paradox in their ideological foundations—a factor which has indeed been vital for perpetuating the alliance. Contrary to notions of post-revolution Iran’s foreign policy as fanatic and purely religiously driven, the Islamic Republic’s partnership with Ba‘thist Syria was not constructed on a spiritual basis to spread Shi‘a ideology. Rather it was primarily aimed at reaching out to the Sunni movements in the Arab East, a policy that was in line with Tehran’s overall strategy to present itself as the heart of Muslim revolutionary struggles and a champion of resistance for both Sunni and Shi‘i movements. To export the revolution, the clergy in Tehran established ties with Hamas, the Islamic Jihad in Palestine and Egypt and the Muslim Brotherhood, including its Syrian branch, as well as Sunni clerical factions in Lebanon. This alliance lent a very credible Sunni dimension to the Islamic Republic’s policy. The Islamic Republic’s effort to shed its image as a Shi‘i entity and assume an Islamic universalist discourse should be seen in the historical context of Iran’s ethnic and religious isolation in the region. Historically, Iran’s identification with the Shi‘a has been an obstacle to claiming a universalist Islamic mantle and gave its regional rivals a pretext for depicting it as heretical Persian entity. Iran’s regional rivals have been able to undermine Tehran’s endeavor to overcome these ethnic and cultural barriers to its regional influence by highlighting Iran’s Shi‘i and Persian characteristics. This partly explains why media affiliated with Saudi Arabia and Qatar constantly project a provocative sectarian image of Tehran’s involvement in the region to both demonize the clergy and mobilize Sunni public opinion. For Tehran, the paramount importance of Syria is its geographic location at the heart of the Arab East and its historic role as a bastion for pan-Arabism. This ideological weight was significant during the Iraq-Iran war when Hafez al-Assad’s support blunted Saddam Hussein’s anti-Iranian propaganda and prevented the conflict from becoming an all-Arab war against Persians. Syria is an essential link to the frontline of the struggle with Israel and an entry point into the Palestinian and Lebanese arenas. For Iran, an unfriendly regime or a power vacuum in Damascus, resulting in the spread of extremists to neighboring countries, would jeopardize Iran’s allies in both Lebanon and Iraq. The partnership between a divine state in Iran and a secular Baʿthist Syria is in the first place a product of these historical and geostrategic factors. The irony of this alliance is that the two states espouse contradictory ideologies. At odds with prevailing views, it is not religious affinity but ideological disagreement that has been a crucial factor in the longevity of the Syrian–Iranian axis. 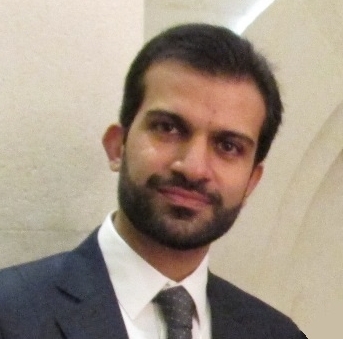 As Jubin Goodarzi argues in his book about Syria–Iran relations, “in the Middle East, the record clearly shows that states sharing a common ideology compete for the mantle of leadership rather than form durable alliances.” An example of this is that despite the structural and ideological similarities between Assad’s and Saddam Hussein’s regimes, the unity plans between the two Baathist parties in the 1970s ended in failure and animosity partly because each claimed to be the legitimate leader of Ba‘thist pan-Arabism. The ideological paradox, however, did exact a toll on the Syria–Iran relationship in the formative years of the alliance. In the 1980s, the former Syrian President Hafez al-Assad was concerned with the export of the Islamic Revolution and connections between Iran and his Muslim Brotherhood opposition. While Iran’s relationship with the Syrian Muslim Brotherhood remained limited, the clergy’s support for radical Sunni factions and Hezbollah, an alternative to the pro-Syrian secular Amal, led to major tensions between Damascus and Tehran in Lebanon. Likewise, the Iranian clergy were upset with anti-Islamic practices of the ruling Ba‘thists. Around the same time that the ayatollahs in Iran imposed an Islamic dress code on women, the Ba‘thists in Syria sought to enforce the unveiling of women and to target any public Islamic symbols that could bear a trace of the Muslim Brotherhood. The Iranian diplomats in Syria were appalled by the Ba‘thist’s extreme policies, such as harassing ordinary people merely for their Islamic look. At one point Syrian security forces even arrested an Iranian diplomat and his chadur-clad wife in a Damascus street and took them into custody believing that they were Muslim Brotherhood supporters. The paradox of the alliance between the Iranian clergy and secular Ba‘thists of Syria is one of the most intriguing aspects of the partnership between the “odd couple.” The alliance’s survival to this day despite various internal contradictions and regional differences remains an exceptional phenomenon in the history of the modern Middle East. The Damascus-Tehran relationship should be primarily analyzed in this context and not by the two states’ common Shi‘i roots. Recognizing the complexity of the historical and geopolitical factors behind the alliance would provide insights into building a common ground with Iran over solving regional problems, including the conflict in Syria. * Mohammad Ataie is an Iranian journalist and a PhD student in History at the University of Massachusetts Amherst. A previous post from Mohammad can be viewed here. I like this article. Keep the good job SC. 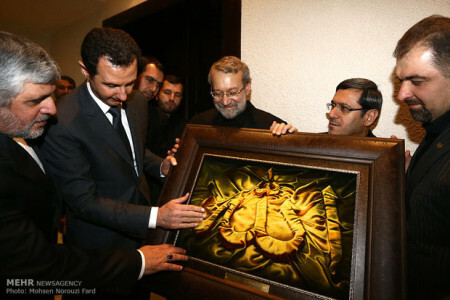 Looking at the photo of president Assad receiving a large and gleaming golden frame of “Allah” from Ali Larijani fills my heart of determination, faith in God, and victory. The sectarian factor in regional politics is overblown. Economic and political interests are a lot more important especially when we are talking about governments that divide citizens between supporters and opponents without placing sectarian affiliation in the center of things. Iran supports Hamas and had good relationship with the Muslim brotherhood and still maintain a relationship with the Taliban. Even Bandar of Saudi arabia declared that his opposition to Bashar is not due to the fact that Bashar is an alawite: “we dealt with his father for 30 years and it is not like we just discovered that Syria is ruled by an alawite”. The islamic Revolution of Iran was a game changer and I maintain that the rise of the mullahs was not good for the region, some may disagree. Ya right, “In Assad you trust”! “God willing, we will witness the funeral of your sons,” they say. The reason for the alliance is really simple: the mutual interest of self-preservation. The Iranians have become more Ba’athist and the Baathists have become more Iranian. In 1979 Khomeini came to power through the revolution of the bazaari merchants, promising deregulation, and strict Islamic principles including supporting the anti-Soviet opposition in Afghanistan as well as preventing birth control/family planning. Ten years later 1989, Iran has witnessed the full conversion of its economy into a socialist system with 90% of all businesses nationalized, totally closed off to foreign investment, and one of the most efficient family planning/birth control systems in the world after China. It is not easy to predict the behaviour and preferences of the Iranian regime. I don’t understand why you see this as a pro-regime article, is it? It seems like an investigation about how these two countries, that should naturally have very little in common, have been allies for so long. That’s worthwhile no matter what your position on the war. The picture of Bashar getting the gaudy gift is just comical and makes you want to laugh. It was definitely propaganda when it was taken, but its use here seems like more to show the quirky relationship being discussed. Jamal I don’t see what here bolsters your sense of “patriotism” or whatnot. This is just a look at history that doesn’t vindicate you. And don’t you feel depressed about your rah-rah cheerleading during a period of tremendous regime losses all around the country? I mean I’m not gloating at you but you’re kind of swimming upstream here. Better to not fight reality, you might find yourself very disappointed with the outcome. Well, it looks like the Druze have rightfully declared independence in practice. If independence is good for a nation, then it is good for the Druze too. They want and deserve their own canton. The FSA seeems to honor that and they pulled out of Thalah airbase, as that now belongs to the Druze canton, which has become autonomous. The Druze have declared that their people cannot be conscripted by SAA anymore, and they have confiscated all SAA’s arms in the province. They are searching for Assad’s chief intelligence murderer in Suweida to give him a bit of his own medicine. Soon we will see the Druze and the FSA (minus JaN) team up and kick out the national socialists fascists (Baathists) and the Islamic socialist fascists (ISIS). 13 rebel groups have pledged unity with the Druze. Article 13(h): Any sizable region with well defined geographic boundaries, whether ethnically homogeneous or not, has the right subject to this Charter to declare political autonomy in a plebiscite with the consent of 62.5% majority of the inhabitants. Said region will then enter into confederation with other regions. The Articles of this Charter shall apply to the autonomous region. IRGC is now executing Alawite offciers at the Hama airbase for insubordination and lack of self-sacrifice for Iranian interests. This should teach the Alawites not to sell themselves to foreigners so cheaply. Local NDF militia refusing to fight for Iranians. Tal Abyad in Raqqa province on the Turkish border, has almost fallen to the joint YPG-YPJ-FSA-Peshmarga-US airforce forces. Tal Abyad has been cut off from Raqqa and the ISIS friends of Assad are thus fleeing to Turkey (with Erdogan’s support) so they don’t get captured and brought to justice. Kurd’s dream of separation has become a reality. All of Syria’s border with Turkey now in the hands of the Kurds from the Tigres to Kobani on the Euphrates. And then the Afrin canton by Hatay province is the remainder of the new state (Rojava – note: Arabs can’t even pronounce this because they don’t have the letter ‘v’ in their alphabet). Kurds have now established an almost continguous Kurdistan from Iran to the Mediterranean sea. This new state will be democratic and observe human rights. PYD has renounced Marxism in favor of left-libertarianism (or anarchism – see Michael Bukanin). Erdogan is very unhappy that Tal Abyad is again becoming a Kurdish town, as it was before the 1960s. In the 1960s, the Baath party moved Arabs there to replace Kurds in a nefarious program of ethnic cleansing against Kurds and Turkmen. Then in 2013, the anti-Assad Islamics expelled half the city which was still Kurdish and took over their homes. Then in 2014 handed the city to ISIS, which is being propped by Erdogan. Now Erdogan is unhappy that the city is reverting back to its historic owners. Unlike the Baathist Arabs, the US-backed Kurds have said they will not expel the Arabs or Turkmen from the city, and they can retrun to their homes. The sunni public opinion in Syria did not need any media to be mobilized . It experienced first hand the Shiaa hateful sectarianism with the Shiaa Lebanese, Iraqi, and Afghan fighters being recruited to slaughter Syrians in order to protect a tomb of a dead woman , a Shiaa diety in Zainab shrine- now for those fighters nothing but pure and simple sectarianism making them capable of slaughtering 220k Syrian souls- yet it is geopolitical reasons that prompts the turban- in- Chiefs to mobilize the masses using sectarianisn. Let us not نخلط الحابل بالنابل and use sophisticated writings to vindicate the Persians and their tail HA. Lool, keep dreaming. After Nusra’s massacre, local Druze helped the SSA recapture a base. The US was spending 1 $ billion a year on “moderate rebels” in Syria only to find out that most of the weapons were sold or taken by terrorist groups, the bigger question is whether this was a mistake or a deliberate attempt to use terrorists to fight a mutual enemy. The premise of the article is suspect, namely, that the conflict is NOT sectarian. Yeah. Sure. Iraq, Syria, Lebanon and now Yemen. Syria is just another foothold in Iran’s arsenal. Moreover, the nuclear question is in the hands of one “Supreme Theocrat” and scares the crap not just out of Israel, but the whole friggin’ world. Most of the rebels in Syria today are members of terrorist movements, those people do not care whether you are a sunni or shia, they want to conquer any area they can reach and kill anybody who does not pass their litmus test, they target Shia to look like sunni defenders. Israel, the CIA, Turkey and the GCC have all in one way or the other supported islamist rebels or used the sectarian factor to hurt regimes and countries that are allies of Iran, Israelis are the last people who have the right to complain about terrorism when their founding fathers were common terrorists and their own police and army killed civilians, destroyed civilian infrastructure and practiced apartheid against non Jewish residents. There are no good politicians or good regimes in the Middle East, and the same can be said about the policies of foreign governments in the Middle East. Western “democracies” are held accountable only when the subject is western citizens (or Israeli citizens)but when the issue is the lives of Arabs and Muslims you will immediately see double standards and hypocrisy. YOU CAN NOT FIX STUPID !! The Center for political beauty has oncemore set the stage for an awesome project. They will bring the bodies of dead refugges who were drowned to Berlin, right in front of the office of Chancellor Merkel. I like how we keep marching forward while terrorists and their get killed or only bark loudly. !!! just look in the mirror Grandpa! Stop distorting this forum with your videos. Nobody watches them and nobody gives a damn about them. We are here to have civilized resourceful debates not watching movies. Got that leave us alone, otherwise I’ll start posting videos of Assad’s family. Akbar, the “Right to resist” Article 22(d) against attempts to deprive a person from the rights includes acts which may be unlawful. This is because the Charter stands above the laws. If an unlawful act is deemed in a court to be taken in order to preserve or regain a right, then it is not unlawful. Israel, the CIA, Turkey and the GCC have all in one way or the other supported islamist rebels or used the sectarian factor to hurt regimes and countries that are allies of Iran, ..
Wrong. CIA tries hard not to arm the Islamists or train the Islamists. There is no evidence that Israel is collaborating with Islamists. In fact the US is bombing Islamists both in NE Syria and northern Syria. Know the facts. The sectarian factor were brought in by Assad in Syria, and by Shiites in Iraq. Why did Assad favor Alawites over Sunnis for half a century? Great news — The Kurds with the help of the Christians, the FSA and the US airforce have taken over Tal Abyad, while ISIS looted the city and fled to Raqqa and Turkey. I don’t see a single Assadist here happy about this. That is because Assad loves ISIS and wants ISIS to take over eastern Syria, because Assad is a traitor to his country and believes he will be more secure if terrorists take over the rest of Syria. ISIS never attacks SAA, and the SAA handed Palmyra and the oil and gas fields over to ISIS. ISIS fights the rebels all over the country, but never fights the SAA. But the forces of democracy and freedom will bring down Assadist fascism and sectarianism. Assad is withdrawing to a rump state on the coast, and will have to relinquish Damascus pretty soon. The Kurds have now completed separating from Syria (and Iraq). The Druze have also essentially separated by defying Assad and the Mokhaberat. They will achieve democracy while the Arabs will continue the violence and sectarianism. Sorry Jamal, but you will be living under Sunni control pretty soon. Maybe you will receive some of that medicine that you have been dishing out? You should start packing and moving to Latakia. There you can entertain bearded hezbollahi goons who will run your new country. You can “polish their shoes” for a living, instead of parasiting on the Syrians. Major battles going on now in Aleppo. The rebels are advancing in western Aleppo, catching the SAA off guard. The military research center (torture center) at Rashidayn has been captured. Parts of Layramoun/Khalidiya, NW of Aleppo liberated. As I have predicted, Assad wants to hand over Aleppo to ISIS. But the rebels are smarter than that and are capturing Aleppo before Assad the ISIS buddy hands it over to ISIS like he did Palmyra. YPG Kurds arresting a bunch of Assadist death squad (SAA NDF and Shabiha) murderers in Qamishlo. Right. We’ll here in the US we have the right to bear arms. IOW, the government can’t strip us of our ability to defend ourselves and our belongings. This 2nd amendment right also discusses a “well ordered militia” so that we don’t get inundated with violent gangs and militias who feel they can take the law into their own hands. The article actually confirms the REAl thinking of the Irainan government . It is flexible when it comes to finding any potential allies along REAd sectarian lines , the regime in Damascus knows its enemies : the majorities Sunni Arabs while the Iranians find the Allwites ready recruits to be gradually converted , that is Irannset up at least 8. So called cultural centers which aggravated the Syrian people . The smarts being done with Zaidis in Yemen . The key thing is that the Iranian revolution and consitition is sectarian in its essence .this article is semi elaborate attempt to deflect and confuse , the writer knows better . You know Akbar, the founding fathers of America, 250 years ago, had great vision and insights, and the result was a decent constitution and a bill of rights — and a country founded on civil society. But look at the state of the Arabs in the middle east and generally almost all other Islamic country, Iran included. There is no vision to achieve civil society, democracy, and liberalism, or enlightenment. All we see in these places are violence, bigotry, dogmatism, and personal interest at social cost. It can never be win-win — it’s gotta be win-lose or its not worth it. The Arabs can keep on blaming so-called imperialism, GWB or the CIA or the Israelis till the cows come home. But do they have the courage to point at the mirror? That would be what is necessary to have statesmen like Jefferson, Madison, Washington, Ataturk, to lead their people out of poverty and socio-economic-political backwardness. But no, violence, tribalism and conspiracy theory must come first. There are no people who are more politically stupider and underdeveloped — but hey they think they are so clever and above the rest of the world, which has nothing better to do but eye their resources. All you got to do is to blame the CIA, and hey you have your Arab statesman. Is there anything done by dog-poop athad that is not tragicomical. But I also add to your good comment that from my own experience, all things done by the Iranian regime look quirky, fake and cheap. Oh my God, just noticed, what the hell happened to the Math Quiz? ….